NOTE: The conversation below on how to ignite innovation first appeared on the web site of TeskaLabs, a Europe-based security startup selected to join the IDEALondon program, powered by Cisco, DJ Thomson and University College of London. A big thanks to Cindy Dam, TeskaLab’s marketing and community manager, for permission to re-post her Q&A blog. An interview with Alex Goryachev, Senior Director – Innovation Strategy & Programs Corporate Strategic Innovation Group, Cisco, is a part of a series of interviews on enterprise innovation with corporate intrapreneurs, technology enthusiasts and visionaries within some of the world’s largest companies. Cindy Dam: Hi Alex, could you please tell us more about yourself and how you got involved with Cisco’s innovation programs and this particular Innovate Everywhere Challenge? First, I really appreciate your invitation here to share how Cisco innovates. Co-innovation is key to developing the next big thing. Open collaboration at our Innovation Centers with startups such as TeskaLabs helps all of us get better at delivering game-changing solutions. I have always had a passion for disruptive innovation, whether in startups and big companies such as Cisco. My goal has always been to get things done quickly and pave the entrepreneurship by turning disruptive concepts and emerging business models into revenue. I have been involved in innovation and cultural transformation initiatives for more than two decades, having worked for startups such as Napster and LiquidAudio, and blue chips such as IBM and Pfizer. I have been lucky enough to remain on the cutting edge of the digital revolution at Cisco since 2004, enabling me to be the disruptor-in-residence at a big company. Initially, I focused on building an ecosystem of innovation partners, including startups, entrepreneurs, developers, academia, incubators, accelerators and venture capital firms. Our focus was mostly external: We have built nine Innovation Centers worldwide as hubs to co-innovate with customers and partners. I also lead our annual, external Innovation Grand Challenges, which attract thousands of ventures around the world. These have had a huge impact on accelerating innovation by awarding cash prizes, resources and mentorship to our winners. By the way, entries for this year’s challenge end on Aug. 31. From these experiences, I have learned that innovation can come from anyone and anywhere. That’s why we decided to expand the focus of our innovation programs to our own workforce – all 72,000 Cisco employees. We drew from best practices and our own lessons learned – both internally and externally. Innovation is one of Cisco’s top business priorities, and this new program helps to transform our culture into one where each employee thinks and acts more like the entrepreneurs we work with in our partner ecosystem. Nearly 50% of our workforce engaged in the Innovate Everywhere Challenge, and we generated more than 1,100 ideas from more than 2,000 ventures. We’re backing eight venture teams now from the three winners and five of the semifinalists. Most importantly, this program jumpstarted a community of entrepreneurs and mentors who are practicing and socializing Lean Startup methodologies. We will continue to run and build on the successes of this company-wide innovation disruption. CD: Innovate Everywhere isn’t the only large-scale innovation program coming out of Cisco. There were the Cisco Entrepreneurs in Residence (Vienna), Challenge Up! (Krakow) and the IDEALondon (London) which TeskaLabs is a proud member. What are the main differences between these programs? We have an incredible amount of programs at Cisco that just focus on accelerating innovation internally and externally. I have already mentioned a few. Many others reside in various business units. Our overall innovation strategy is to either build it ourselves, acquire complementary technologies, invest in promising ventures, partner with others, co-develop with customers and leading innovators around ideas built on our digital network. We invest in companies at every stage of funding, but the Entrepreneurs in Residence program focuses on early-stage companies. We offer exceptional entrepreneurs opportunities to build strategic relationships with Cisco, co-working space, software tools, and access to venture capitalists and experts through program events. Challenge Up!, a partnership with Intel and Deutsche Telekom, is now in its second year. IDEALondon is a groundbreaking collaboration among Cisco, DC Thomson and UCL in the heart of London’s Tech City for startups wanting to commercialize their business. We have many other such programs worldwide that provide tailored support, strategic acceleration programs and high-caliber mentors. Internally, the Innovate Everywhere Challenge not only helped to spark entrepreneurism in every job function, grade level and location. It also broke through business unit siloes by encouraging all employees to form cross-functional teams, and leverage best practices of departmental innovation programs in one place at one time for everyone. We worked with 16 different groups, which we called our “co-conspirators,” to help plan the company-wide challenge. This includes the Cisco Innovation Academy, which helps leaders generate brilliant ideas from their teams during the initial Ideation phase; the Services Innovation Excellence Center, which helps existing teams build deeply embedded innovation capabilities with measure results; and, Startup//Cisco, a complementary grassroots effort created to innovate the right thing in less time with fewer resources. What’s even more important, we intend to enrich and expand both internal and external programs to accelerate innovation even more. We will ensure ongoing support of our employee winners, collaboration with customers at Innovation Centers, and working together with startups to solve customer problems. CD: What advice/tips do you have for someone who thinks he/she has good ideas but without connection to a team? What could he/she do to improve the chance of getting their applications selected and advancing to the next round, and perhaps win the challenge? This advice is equally important to anyone who wants to bring their idea to life, whether in an organized challenge or in the marketplace. First, teams are just as important as the idea itself. Innovation is really more of a team sport requiring diverse players than the traditional approach of following rigid processes. Companies should openly invest in teams, making sure they have the right resources, skills and complementary strengths. Successful startups require not only engineers, but also people in sales, marketing, HR, finance, operations and more. Second, it’s important to secure early validation from potential customers. Make sure you investigate, test and validate your idea with customers before development. You can’t always read the minds of your customer, so it’s good to get their endorsement and hopefully their willingness to partner with you. Third, make sure your business case is thoughtfully balanced and presentable. Study how startups pitch their business case to venture capitalists and follow that format. A good business case focuses on the strengths of the team, the technology and the value proposition. Ask yourself, “If you were an investor, would you invest in this venture? If not, what is lacking?” Significantly, practice your pitch repeatedly in front of partners, friends and family. I know one successful entrepreneur who practices his pitch ten times a day, every day to make sure the message is clear, crisp and compelling. CD: In recent times, I see more large enterprises rolling out their own innovation and startup programs. However, it seems that Cisco is leading the pack with its variety and diversity of its programs ranging from a global challenge like Innovate Everywhere to acting as an in-house incubator, and partnering up with other corporations like Intel, Deutsche Telekom, startup accelerators and academic institutions. What sort of results do you/Cisco expect from these programs? In other words, how does Cisco measure the success of these programs? One of the biggest mistakes companies can make is applying traditional measurements to transformational work such as innovation. Financial measurements such as Net Present Value or Rate of Return really aren’t relevant when gauging the success of an innovation program. Innovation projects also have different levels of risk, uncertainty and relationships in both the short- and long-term that require new ways to determine success. They require a vision, a leap of faith. In our external programs, we measure success through the number and quality of relationships we forge with partners, unique co-innovations that emerge from them, and customer adoption of the solutions. Internally, we measure things like employee engagement, formation of informal networks, or the growth and strength of our community of innovation mentors and coaches. We also look at the impact of the program on attracting and retaining the best talent and uncovering novel technologies and business models. We will evolve these measures in future challenges, including outcomes and financial impact of winning teams. Of course, the ultimate measure for any internal or external innovation program is to create new solutions that add leapfrog value for customers, the solution provider and their employees. Not all innovation projects though can be monetized. Strong teams, for example, might not necessarily bring in money, but they help the company down the road. Even failures can be useful learning experiences that can lead to successes in the future. A team of people work creatively together building giant digital tablets. This are like skyscrapers, and create a city. Other people download this content on their mobile devices. Horizontal composition. CD: Almost every large company was once a startup. However, when they get bigger, they need processes to grow and scale, so it gradually becomes more important to stick to the tried-and-true instead of trying let alone doing something new. What makes Cisco different from others? How can a company of this magnitude still maintain this innovative spirit and startup nature as if it has been ingrained in its DNA? At Cisco, our recent innovation initiatives definitely tilt toward a more disruptive Lean Startup approach. Cisco began in 1984, and our innovation programs aim to revive our startup roots by encouraging and training all employees to think and act like entrepreneurs. How do we stay on top of innovation? We track and take advantage of market transitions, such today’s massive digitization of countries and companies. We relentlessly focus on the needs and outcomes of our customers, listen to our partners – and employees – and embrace change – even when it’s highly disruptive. We believe it is everyone’s job to innovate. We emphasize this throughout the organization with development opportunities, events, programs and environment where employees feel empowered to think and act creatively outside their day jobs. 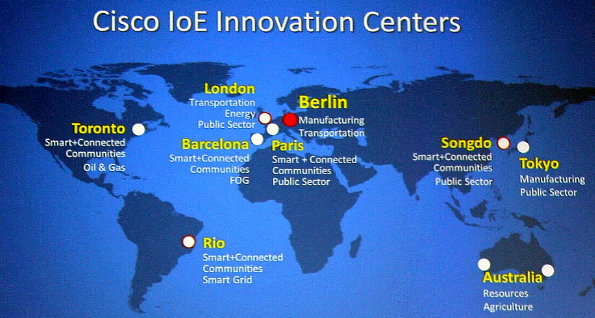 CD: Cisco is setting the “every” trend, for example, the Internet of Everything and the Innovate Everywhere Challenge. What are some other “every” trends started or adopted by Cisco? What could be a new “every” phenomenon in your opinion? Clearly, the “every” phenomenon today is the mass digitization of business and society. The volume of data generated today via smart devices linked to the Internet is mind-boggling. Today’s Internet is the digital platform – or network — from which innovators can connect, collaborate and develop transformational improvements in every market sector. We are leading efforts to enhance the digital platform to deliver customer solutions that are optimized with analytics and security end-to-end, from the database to the physical edge of operations, what’s often called Fog Computing. The convergence of Internet of Things technologies on the Internet — from nano sensors, artificial intelligence and robotics to blockchain, drones and machine learning — opens up new vistas of opportunity never previously imagined. The World Economic Forum highlight these and other technology trends such as next-gen batteries and autonomous cars are in their recent report on top emerging technologies. Through our innovator and physical network, we are involved in essentially all of these new technologies and business models to co-innovate outcome-based solutions in nearly all industry sectors. Excellent interview with great questions an answers. Yes, in this days to keep the pace to the evolution of technological changes, is also hard work and willingness to achieve the highest goals, that’s an important piece of innovation, through well focused ideas and the clear vision to define what could work or not in every case. Thank you again for sharing valuable information and tips.